What are Kidney Stones and how are they Treated? While most of us have heard about kidney stones in one way or the other, only a few of us truly understand what they are and what causes them. However, knowing how to identify kidney stones early and getting treatment as soon as possible is key to a smooth and fast recovery with minimal complications. In this article, we’re going to address what kidney stones are exactly, what are the symptoms, and what are the possible treatment options available. What are Kidney Stones actually? 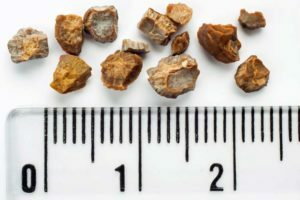 Kidney stones, also known as renal calculi, are masses made of crystals that usually form in your kidneys. While they are often associated with kidneys, they can form pretty much anywhere in your urinary tract. While the symptoms are often similar, the stones themselves can have different compositions. Kidney stones are either made from calcium, uric acid, struvite or cystine. Calcium kidney stones are the ones that occur the most often. They’re usually made of either calcium oxalate, calcium maleate or phosphate. 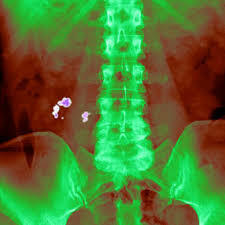 Kidney stones caused by uric acid occur when the urine becomes too acidic. This is often the case when people undergo chemotherapy. These are usually more common in men. Struvite stones, on the other hand, are usually more commonly found in women who are suffering from a urinary tract infection. Cystine stones are the rarest and are caused by a genetic condition called cystinuria. One of the clearest signs of kidney stones is radiating pain around the groin/pelvic area, your lower back, and sides, as well as your abdomen region. In some cases, you might only experience symptoms when the stones are coming doing your ureter. Other symptoms might include blood in your urine, nausea, vomiting, strong smelling urine and a frequent need to urinate. In some cases, kidney stones may be accompanied by strong bouts of fever as well. The treatment that will be prescribed will depend on the severity of the kidney stones. For smaller kidney stones with little to no symptoms, you may be asked to drink a lot of water in order to pass the stone(s). You will be usually asked to drink enough water for your urine to be clear or near clear. You might also be prescribed some over the counter pain relief medicine and some alpha blockers that will relax your ureter muscles and allow you to pass the stone. For severe cases, however, you might be required to undergo a procedure referred to as extracorporeal shock wave lithotripsy. It uses sound waves to destroy the kidney stones and allow you to pass them. You might also have to go under percutaneous nephrolithotomy surgery to remove larger kidney stones. If you have any of the symptoms mentioned in this article, contact us today to schedule an appointment with the best urologist doctor in NYC.